A selection of Rosso Gravner produced only in the best years. Fermented on the skins in open oak vats for five weeks with wild yeasts and no temperature control. Aged in oak barrels for seven years and subsequently in bottles for another seven years. Bottled during a wining moon without fining or filtration. Joško Gravner is .... Joško Gravner. His wines are the result of the nature, terrain and thinking. When he completely changed the thinking about wine and its production with the vintage 1998, people were shocked. A winemaker who says that he doesn’t drink wine which he produced till 1998. To be sure, this was one of the best wines in Italy at the time. Year 1998 wines he macerated longer, they were cloudy, different and people didn’t understand it. Today, he even went a step further (wines macerate for six months of the amphoras) and got primate in Italy. 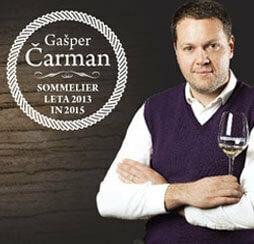 He became the winemaker of the year, Ribolla and Breg 2002, received 3 clusters in the book Vini d`Italia.